The 47th annual Delta Farm Forum will take place March 2 in Delta Junction. The forum features the latest agricultural news, recommendations and research. It’s also a community event. Milan Shipka, the acting director of the UAF School of Natural Resources and Extension, will welcome participants at 9 a.m. and the forum will run until about 4:30 p.m. in the Delta High School small gym. 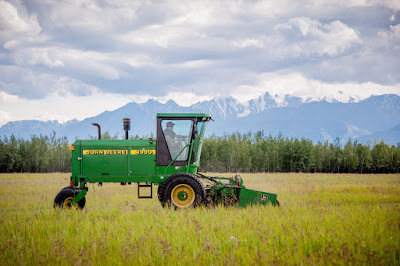 Topics will include the livestock industry, the Alaska Farmers Co-op new seed-cleaning service, reindeer and red meat production, a new Fairbanks fiber mill, produce safety and non-timber forest products permits. Dr. Robert Gerlach, the state veterinarian, will talk about Mycoplasma ovipneumoniae, or M. ovi, a respiratory pathogen that affects domestic and wild sheep, goats and musk ox. Gerlach will provide background on the pathogen and talk about how Alaska’s situation is different than the Lower 48, where a strain of the pathogen has caused disease and death in bighorn sheep. He will discuss research results and discuss options the state and livestock producers have to mitigate the threat of pathogen transfer between livestock and wildlife. The Alaska Department of Fish and Game says the pathogen has been detected in a small number of Dall sheep and mountain goats, in healthy moose and caribou in Alaska and in a small number of domestic sheep and goats, which did not show signs of illness. See the full schedule for the forum. The University of Alaska Fairbanks Cooperative Extension Service, the Salcha-Delta Soil and Water Conservation District and the Partners for Progress in Delta, Inc. co-sponsor the forum. For more information, contact Delta Extension at 907-895-4215 or at pnkaspari@alaska.edu, or call the conservation district at 907-895-6279.